Welcome to our web site. You have now made the first step to becoming a safe and competent driver. Below we have answered some of the most frequently asked questions. What do I need before I start learning to drive? You will require a provisional licence; your local post office should have the required application form. You will also need two passport size photographs of yourself to send off with the form. Only an approved Driving Standards Agency instructor may accept payment for giving driving lessons. A fully qualified A.D.I (Approved Driving Instructor) will display a green licence in the windscreen of the car. A trainee instructor may also teach for payment and he or she will display a pink licence. How good is my instructor? Driving instructors are graded with checks on their ability every few years. Grade B is a good instructor. Grade A is an excellent instructor. We have ONLY grade A instructors in our driving school. 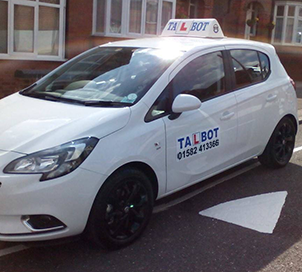 A fully qualified driving Instructor is called an ADI a trainee Instructor is called a PDI - we do not employ trainee's at Talbot. Many factors come into this: experience of cycling, motorbikes, driving practice with relatives and, of course, your age. As we get older tasks do not come as easy as when we are young. The DSA recommends 40 - 45 hours before being ready for the test. But everyone has his or her own pace and we will help you make progress as quickly as possible. The instructor will meet you at your home or a place of your choosing. Following a friendly introduction and welcome, he or she will ask to see your provisional driving licence. Your instructor will then ask you to read a car number plate at the required distance of 67 feet (20.5 metres) with glasses if worn. If this is your first lesson, you may prefer the instructor to start your lesson away from home and in a quiet location. Our staff are friendly and patient, their aim is to see you progress in your driving as fast and as safely as possible. So relax and enjoy yourself. What type of car will I be driving? Our fleet of cars are all fully equipped with dual-controls and have been chosen for their suitability, reliability, good all-round vision and ease of driving. What happens at the end of the lesson? Your instructor will discuss your progress with you and advise you on the next step. He or she will maintain your progress records, as well as booking your future driving lessons with you. How much will lessons cost? Areas covered are Luton, Dunstable, Houghton Regis and surrounding areas. If you would like to book a driving lesson or any of our other courses, simply telephone the head office on 01582 413366. We will be pleased to help in any way we can. If you would like us to contact you, then please send us a message using our information request form and we will get back to you as soon as possible.